Baris was one of the first dogs to arrive. He was imported by his owner Zuhal Mills from France at the age of one. Baris has pruduced one litter of pups since he arrived with his partner Beste. Mrs Mills said three of the pups still live in Perth. ‘Kangals are very loving, sensitive and loyal and also prone to getting upset and sulking,’ she said. Kangals work as watchdogs and have a very deep bark, Mrs Mills said. As far as working dogs go, Mrs Mills believes they are as good as Australian cattle and sheepdogs. But she said they were not for ‘people who want obedience from their dog’. Originally hailing from Turkey, Mrs Mills said they were a dog she grew up with and she understands their mentality. 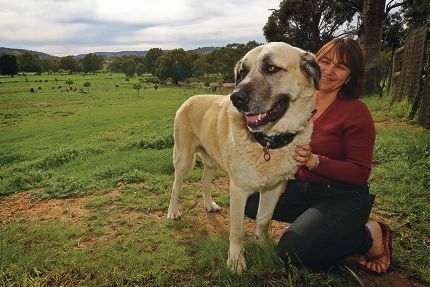 ‘They are a primitive dog that bond strongly with livestock and owners,’ she said. Kangals are known for their calm and alert temperament. Usually, the dogs grows to about 71-81cm in height and possess a short and thick undercoat.